Pre Snap, Cards line up in the Shotgun and go four wide. Notice the lack of any protection in this set for any of our offensive linemen. We do have a RB in on the play, but no TE's as inline blockers to help. We have from the left; Roberts, Doucet, Fitzgerald and Floyd as our four receivers here. One key thing to note here is that Roberts has taken a very wide split, usually an indicator of an inside breaking route. This is a key to this play, you will find out later. As the play develops you can see the back is helping the OL here with the protection, but the OL is going backwards. The Originial LOS was the 15 yard line. The OL has given up about five yards of depth already here. Doucet is running a drag route underneath, this would likely have been a second read on this play, and you can see he does have some space available to him across the middle, but with so little time left, it may not be the smartest throw. At the top of the screen Floyd has two defenders on him on a route that was likely never going to be a part of the play unless a pre-snap read of 1 v 1 man coverage was made. What we see here appears to be a cover 3 from the Dolphins. Back to the key of the play here, Roberts makes his first cut here, he cuts inside towards to posts, this along with his wide split would cause most defensive backs to bit in on this route, especially against cover 3 where the space between a deep corner and a deep safety is a weak point, a weak point often attacked by post routes. Argaubly the two most important part of this play can be seen at the bottom of the screen. Kevin Kolb has climbed up into the pocket, in the process he avoids the pass rusher that has beaten D'Antony Batistes on the backside of the play. The other key here is that Daryn Colledge has made a key block and has his man on the ground giving Kolb that space to climb into. In a game in which this OL gave up 8 sacks this is a good performance here by the QB to step up and the OL to create a pocket to step into. Doucet on the drag has drawn two defenders to him. Fitzgerald is running a corner route (Route to the back corner of the endzone) and you will see later he was also very much an option on this play. Onto Roberts the major attraction on this play. Look at the movement of Smith. The inside post cut of Roberts has drawn Smith in. He is moving towards the inside and the Roberts makes his outside cut. Smith at this stage is both moving in the wrong direction and watching the QB and not the receiver. Roberts has the big time upper hand here and Kolb knows it. Kolb is throwing the ball here. He sees his man has a step on his receiver and he has the space to make the throw. One thing of not is that this route was caught right in the corner of the endzone, but Roberts is a good. 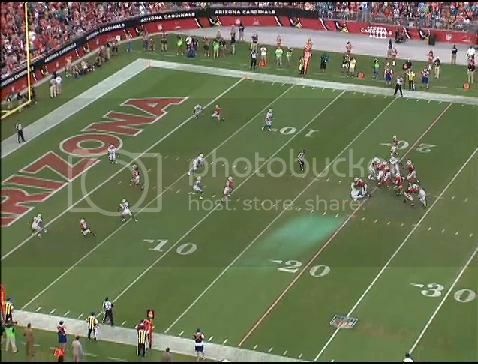 6-8 yards from that spot when the ball is thrown it is a really good example of a QB throwing to a spot rather than to a receiver. This is a great route from Roberts on the double move to shake his defender, but it is also very good play design. 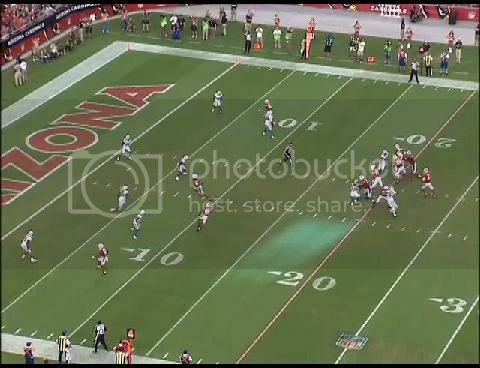 If you notice the positioning of Larry Fitzgerald on his corner route, if Kolb wants to stick on in there for him he can he has the separation on the deep defender and the underneath defender does not have enough depth to take that route away. The touchdown catch is made. Roberts does well to keep his feet inbounds with his momentum taking him towards the sideline. The game is tied with 22 seconds to go and the Cardinals would go on the win the game in overtime. The Cardinals line up in Shotgun Trips Left, Doucet is running a drag/dig route, Floyd is running a post route on the backside, Roberts runs a Post Flag (Cut Inside to the post then cut outside to the Flag (front pylon), Fitzgerald is running a Corner route (To the back pylon). 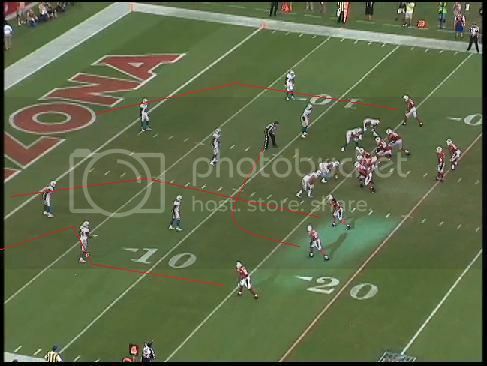 As you can see the Cardinals are really putting stress on the near side safety and corner, especially in a cover three. With Roberts and Fitzgerald ultimately making the same cut and running similar routes. If the shallow defender takes away the underneath throw to Roberts then Fitzgerald is going to be open over the top. This is a well designed play that forces the defenders into making decisions in a split second, however it does require some very good route running. Doucet drawing two defenders here makes this easier for Arizona with one less deep defnder to worry about. Finally with the way Fitzgerald draws the deep center safety with him, this play also then opens space for the backside post route that Floyd is running, at the point of the throw Floyd is well covered, but this is still very much an option on this play. Given good protection this play can be very, very difficult to defend. Arizona ran it very well here and reaped the rewards. 1. That play was 4th and 10 right? Let's say Smith plays the corner there and takes this away from Roberts and the guy doesn't come down on Early, would hitting Early across the middle have gotten the 1st down do you think? Did we have any TOs to use in that scenario? 2. Looking at all the screen shots, the way it develops, I may have actually thrown that ball to Larry. He's open (By Larry's standards anyway). Obviously a great throw to an open WR was made but I personally might have tried Larry there. 3. 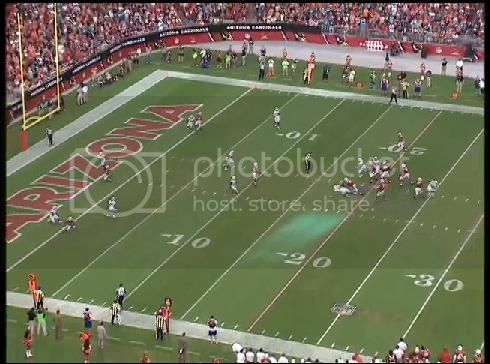 If you look at those 2nd-3rd last screen shots, you'll see Michael Floyd is in a good spot too to be thrown at. 1 on 1, he's got inside position, the high safety wouldn't be able to turn and adjust in time. I think we could have hit Floyd real easy too. Damn. This is a helluva play actually. Props to Mike Miller (Weird as that is to say), this play's legit. Yes TY Khodder for doing this. Top shelf stuff right there. Kolb was clutch in this game no doubt. Multiple 3rd and 4th down conversions to keep the team alive. I see how he had options to work with here but Roberts and Kolb practiced this play earlier in the week and they knew it would work. Clutch 4th down play in the ball game. Khodder pointed it out but the guy who might be the real hero here isn't Kevin Kolb and it isn't Andre Roberts, it's Daryn Colledge. Yes and he allowed Kolb to step up just enough to allow the Roberts to make his break. Regarding the receivers, first I would have cringed if Kolb had thrown it to Floyd as I don't feel he really had the advantage position-wise there. Between Roberts and Fitz, I think Kolb made the logical call. 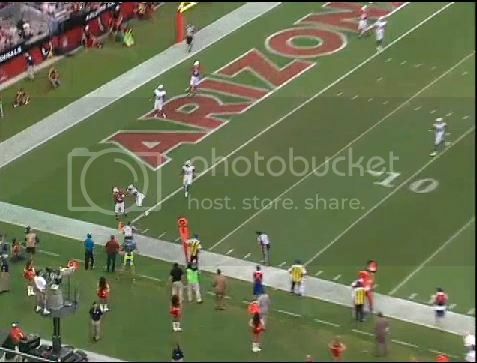 Fitz was open, but the safety facing inside just might have gotten close enough to tip that ball, which would have deflected the pass behind Fitzgerald. The safest option was Roberts IMHO. And under the circumstances of that play, even with the DL's push, our OL, especially Colledge, played well (or at least well enough)! That was a really great play design and obviously the timing of calling that play couldn't have been better! That play never happens if Kolb doesn't step up into the pocket. That block made that play. 1. What do you mean on Floyd? I think he's clearly got the advantage position wise. He's inside, can go in or out, CBs back. Look at the 3rd caption picture from the top, he's in great shape. 2. Nah, that safety/linebacker isn't not anywhere on Fitz. Look at the 4th caption picture, there's too big a window by the time Kolb is ready for his delivery for that defender to get there. Kolb doesn't have a rocket like John Skelton but he's got more than enough arm to that ball into that window in time. I'm not saying Kolb made the wrong decision, he absolutely did not I'm just saying if it were me, I might have tried Larry there. 1 on 1 with our best player in prime position? That's where I'd go. Yeah, in hindsight that gap is too big to have gotten to the ball...Larry was a safe bet too. As for Floyd, I am looking at frames 2, 3, & 4...in frame 2 Floyd is just about to cut toward the goal post and is about to gain inside position as you stated on the CB. Kolb is already looking left but with his feet lined up toward the goal post at the end of his drop, indicating to me that Floyd is still an option at this point. In frame 3 though, the CB likely has a better view of Kolb than Kolb does of Floyd. Kolb has just stepped up in the pocket, is just inside right hash, is still looking left, and his shoulders and hips are lined up toward the back left corner of the endzone...so we know he wants to go left with the ball at this point. Throwing with an open stance to Floyd would have resulted in a weak throw. As we can see from frame 4, Kolb has worked his way to the left to better utilize the nice throwing lane and is just now throwing the ball. The CB on Floyd has already started to jump underneath...IMHO he would have likely contested that pass had it gone to Floyd. I don't think Doucet was really an option at all. He would need 5 YAC and the way the Cover 3 from Miami sets up they essentially have four guys playing zone across the first down marker and the three in a deep zone in the EZ. The playcall worked because of the vertical/medium range stress we put on those three deep guys who all ended up in 1 v 1 matchups whereas Doucet was double teamed. There was a guy waiting to bite down on the back slipping out and the fourth guy who actually got a bit too much depth (Though with no-one of that side of the field short of the first down marker it makes sense) could have taken away the throw to Andre if his feet had been facing the right way, but then you still have the open throw to Fitzgerald. The play design is similar to the "levels" concept and is more than likely a hi-lo read on the left hand side of the field.